Home » 50 Most Recent » If you pay to have me see your posts on Facebook, I will unlike your page (or unfriend you). 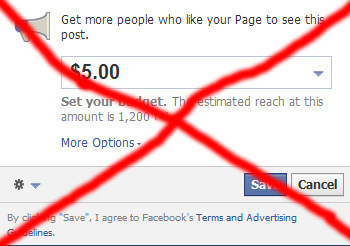 UPDATE: Facebook has added the option to “hide all sponsored posts” from a poster. This is actually an okay solution to me. I always hide all sponsored posts whenever I see one and this means each poster only has one opportunity to unfairly invade my feed. I can live with that. It’s official, you can now buy space in my “social networking” stream. No thanks. In fact, the idea is so irritating to me that I am inclined to take action to help stop it from becoming an accepted part of Facebook. How? If you sponsor a post, I will unlike your page (update: since they now allow profiles to do this, I will unfriend you if you sponsor a profile post). Paying for my eyeballs will result in you losing my eyeballs. I hope everyone will join me in doing this as it’s the only way to stop this from happening. 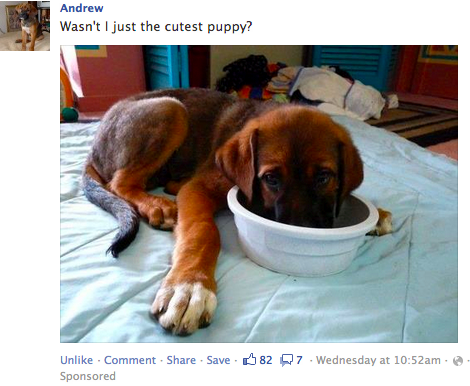 Yes, I am calling for a boycott of “sponsored” posts. Watch this disgusting video justifying this practice because currently pages are crippled and don’t actually show your posts to the people who like the pages. Most users expect that their posts will reach their friends/fans/likers/etc. As it turns out, Facebook has some proprietary algorithm that already prevents what you post from being seen by most people. Now, we’re potentially going to be cluttered with a feed full of paid advertising. I’m not too interested in that. If posts on my page don’t actually reach people, why should I spend energy getting people to like my page? This is a great article about how Facebook is holding our fans hostage. Agreed, but an essential feature of social networking – in fact the only essential feature – is the democratization of content prevalence. Any individual needs to have the same chance of being heard. The result is that interesting posts from interesting people rise up. The content has value because it is selected in this way. Paying to get content to the top, while other content that you’ve explicitly subscribed to is hidden, is THE fundamental destroyer of social networking. Whether it’s intentional or not is unclear, but many of us have been blocked from posting things or received warnings about posting links that are deemed “spam” incorrectly. Even worse is the idea that somehow, Facebook is deciding whether your individual posts should be viewed by others in an undemocratic manner. The inclusion of sponsored posts worsens this. 1. Unlike any page (unfriend any profile) making a sponsored post. 2. More importantly, let them know that you are unliking (unfriending) them because they made a sponsored post. 3. Understand that Facebook is not a good way to reach your audience and that each communication you make reaches only a small percentage of the people who have expressed interested in hearing what you have to say. Keep an e-mail list! How will I know a post is sponsored? Join me! Feel free to leave a comment below or pass this along if you are with me!